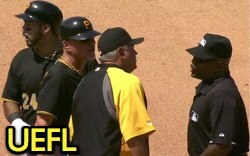 The Pirates argue with umpire Laz Diaz. a tag by first baseman Adam LaRoche. Replays indicate after touching first base, Alvarez made a motion consistent with an attempt to advance (OBR Rule 7.08(j)), the call was correct. At the time of the ejection, the Nationals were leading, 4-3. The Nationals ultimately won the contest, 9-7. This is Laz Diaz (63)'s second ejection of 2013. Laz Diaz now has 8 points in the UEFL (4 + 2 + 2 = 8). Crew Chief Mike Winters now has 8 points in the UEFL's Crew Division (7 Previous + 1 Correct Call = 8). This is the 104th ejection of the 2013 MLB season. This is the 50th Manager ejection of 2013. This is the Pirates' 7th ejection of 2013, 1st in the NL Central (PIT 7; CHC 4; STL 3; MIL 2; CIN 0). This is Clint Hurdle's 4th ejection of 2013 and first since June 3 (Dan Iassogna; QOC = Correct). This is Laz Diaz's first ejection since July 13, 2013 (Bud Black; QOC = Correct). That's tough, and awfully close. It's not a huge obvious turn, but it's there nonetheless. Alvarez approaches and passes first base with obvious intent towards second before he straightens out. Good call. That is awfully close but a good call. I think its a good call. Obviously the nationals noticed it otherwise they wouldn't of bothered to tag him. Paul Emmel should get the most improved award I know it's early but he has how many ejections um zero!!! I'm not surprised that mlb moved emmel to good and experienced. Along side dreck man who does not eject anyone and meals also I think with no ejections darling meals dreck man and emmel to good and experienced meals also in and out, emmel now with Welke crew, Welke now out vaca maybe, Everett is cc I guess by seniority by a half a year of experienced should be emmel being cc. Also that crew did so well they are umpiring six games in Toronto? LAD and now HOU? Maybe that crew will go back to Boston to umpire ppd game 1 of four with Seattle in town the very next day, just a guess on that? Correct me if I'm wrong anyone ? But is this a similar play from darling and posada BAL 9/6/11. (4:03 rain delay). Drake, Darling, dreckman, Emmel. Since when do "no ejections = good umpire"? This is a wild guess but when the Red Sox play the Mariners at Fenway they always seem to have Kellogg, Cooper, Schreiber, Fairchild, with Carlson and Timmons in the mix as well. They haven't had a Sox game since May and Mariners since June. Darling and Meals are garbage. Darling's a consummate professional. Not a fan of Meals. Diaz had the plate tonight in Baltimore. He was far from good. Laz is just not a good umpire, lets be honest. That's not a good call. Watch closely - Alvarez begins to make a motion as if he's going to round 1B BEFORE he gets to the bag. As he's about to stride to the bag, he realizes the ball is still in the INF and straightens out to just cruise to a stop a few strides beyond the bag. Any indication of an attempt to advance happens before he actually touches 1B. Wrong call - incorrect. This whole post makes my head hurt. You do realize that when every sentence is either a fragment or a run-on it makes your post make no sense, right? Did you attend elementary school? His first step past first base is made with his body angled towards second base and with some motion towards second base while at a position consistent with a runner rounding first base with intent to go towards second. Therefore he is not running straight through the base but instead attempting to run towards second base, removing the applicability of 7.08(c) Exemption and instead making him subject to an out call per 7.08(j). Diaz and Timmons have both been awful in their plate duties in Baltimore. Timmons ejected Ortiz for arguing a pitch that was most certainly high.